Delicate, flaky pie crust made with Greek yogurt is filled with a delicious strawberry filling in these individual Strawberry Hand Pies. My love of baking with Greek yogurt continues today, I just had to try making some pie dough with it. The result is amazing, a little healthier than traditional all butter crust, but just as flaky and delicious. There is something about summertime that always makes me want to bake a pie, but I hate waiting for them to finish. 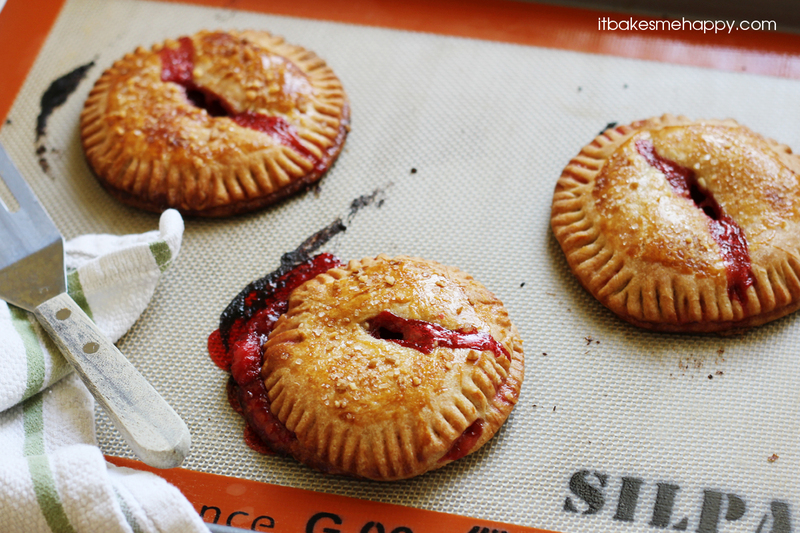 These tasty little hand pies are a great way to enjoy pie in half the time. Plus they’re perfect for your friendly get togethers. These Strawberry Hand Pies are sure to bring a smile to everyone’s faces, enjoy and happy baking! Whisk together the flour, salt, and baking powder, then cut in the butter, until you have a crumbly mixture. The butter should be in large, pea-sized pieces. Stir in the Greek yogurt, the dough will be sticky and still a little crumbly. Turn the dough out onto a floured work surface and knead for a minute until it comes together. Shape the dough into a log, and then roll it into roughly an 8" x 10" rectangle. Dust both sides of the dough with flour, and fold it in three. Flip the dough and roll it again into an 8" x 10" rectangle; folding into three again. Wrap the dough and refrigerate for 30 minutes before using. In a medium sized saucepan add the strawberries, sugar, corn starch and lemon juice and cook for about 5 minutes, until thickened; set aside to cool. Preheat your oven to 425º and line a baking sheet with parchment or a baking mat. Roll the dough out to 1/4" thick and cut it into 8 even rectangles or 8 circles using a 5" cutter. Fill 4 of the cut dough with a heaping Tbs of the filling and brush beaten egg around the edges, place a second cut dough on top and using a fork crimp the edges together. Cut vent holes in the top of each pie, brush with egg and sprinkle with coarse sugar. Bake for 18-20 minutes until golden brown, remove from the oven and cool on the pan 5 minutes; serve warm. These hand pies look delicious! It completely surprised me the use of greek yogurt as part of the crust! Very interesting and worth trying! I came over to visit you via Living Better together and pining onto my Sweet Tooth board! 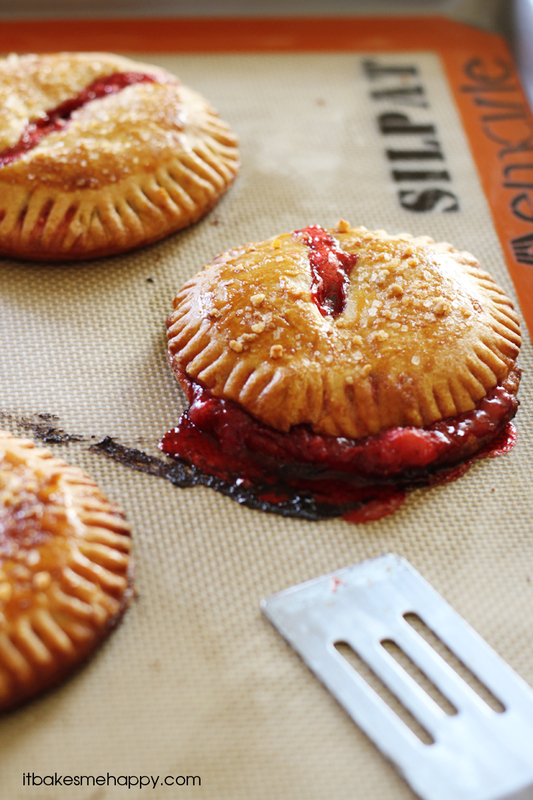 I am loving the addition of yogurt in the crust…what a fun twist to pie crust! The pies turned out gorgeous…I love the deep golden color from baking and all the oozing pie filling! YUM! Dear Emily, your strawberry hand pies look beautiful. I wish I could just reach over and take one. These look SO GOOD!!! LOVE how you used the Greek yogurt! I’ve been using it in my baking a lot too, and love how it makes everything so moist! These look so good!!!! Hi! Stopping over from Living Better Together link party 🙂 They look soooo delicious! I know where to use my strawberries now, thanks! Those are gorgeous Emily! Thank you so much for sharing them with us at Best of the Weekend. Have a wonderful week! I’ll take a dozen of these hand pies please!